Do you remember your mother, or your grandmother making their own delicious jam? Or tasty chutneys and pickles? Many people have fond memories from the past of homemade preserves, but with the easy accessible ready made products on the supermarket shelves the motivation to make their own has been waning... until now! The value of "home made" is seeing a welcome resurgence, but have we lost the knowledge? 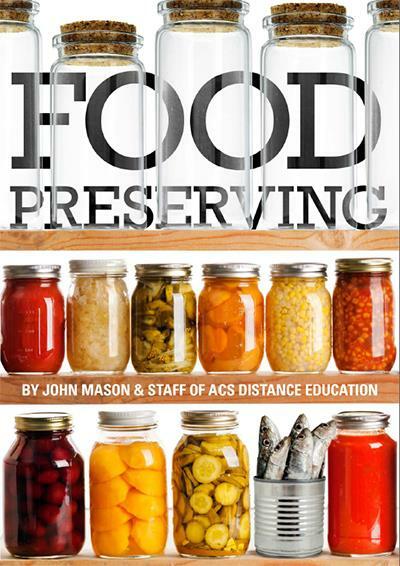 ACS's food preservation e-book comes to the beginner's rescue, introducing the reader to a range of ways to preserve food. The benefits of food preservation is two-fold - it transforms food into tantalising dishes, and prevents food wastage. Learning these skills are useful for the passionate foodie, the conscious house holder, and the busy mother. Passionate foodies get to learn new ways of creating delicious meals - the basics are explained then you can use your creativity to add your own unique flavour to your preserves. The conscious house holder prevents food wastage, and knows exactly what is in their creations - know sneaky sweeteners, additives or preservatives. The busy mother will learn simple strategies to have flavourful, healthy and easy food on hand for their family. Whatever your reason, this book is an exceptionally valuable introduction that covers all of the important techniques, and gives you a fundamental understanding of what can be preserved, and the various ways it can be preserved. Why do we preserve foods? Which foods can be frozen?